The belt conveyors to be replaced cover a distance of 170 metres and are included in the critical part of the Kiruna Mine’s process chain, called the “red line”, which must be running around the clock for LKAB to reach its target of 37 million tonnes of finished ore products per year. “We chose Kiruna Wagon as a partner for this extensive and complex project because we have very good collaborative experience from previous projects. It is a well-structured company with high technical competence, and that Kiruna Wagon is already well acquainted with LKAB’s routines for the sorting plant is of course a big advantage,” said Nils-Erik Strömbäck, Project Manager at LKAB. Crucial for the success of the project is that the installation is carried out during a very short production stop. In order for the downtime to be as brief as possible, the belt conveyors will be built in large modules in Kiruna Wagon’s spacious workshop, where two doors will be merged into one to accommodate the size of the modules. 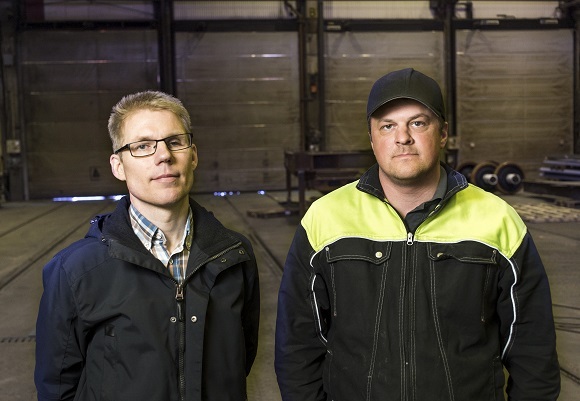 “We have both the staff and the premises to conduct large projects that also include major components,” said Fredrik Kangas, Managing Director at Kiruna Wagon, while emphasising that the assignment is a good example of Kiruna Wagon’s breadth. Bengt Bolsöy, Project Manager at Kiruna Wagon, and Workshop Manager Robert Stålnacke in front of the doors to Kiruna Wagon’s workshop. During the project, two doors will be merged into one large to accommodate the size of the modules built for LKAB. Besides ore wagons, Kiruna Wagon also delivers other types of large and heavy steel structures that require adherence to the most stringent standards in modern steel construction technology. “Our own niche product is ore wagons, but to ensure long-term development in the cyclical mining industry, we have continuously developed and maintained a department for other types of manufacturing projects. In this case, the project is also in line with our vision of being a system supplier for the transport of ore and other dry bulk materials, all the way from pit to port,” said Fredrik Kangas. Kiruna Wagon designs and manufactures both ore wagons and the associated unloading stations, and such overall solutions are currently sought after in the mining industry. The company is now moving towards becoming a supplier of complete unloading terminals, where belt conveyors are often an important part of the logistics chain. The turnkey project for LKAB is a good example of how Kiruna Wagon undertakes a construction project that includes manufacturing, assembly and coordination on site. The project comprises about 600 tonnes of steel and starts this month (April 2017).